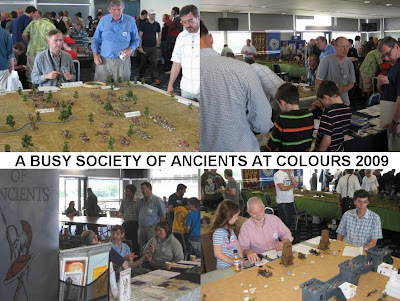 Early September traditionally means Colours, and - for the main Society of Ancients Shows Team - the start of the Autumn events season. This is usually the point where the Summer projects reach completion. As often as not it is also a chance to visit trade stands for the first time in a while too. 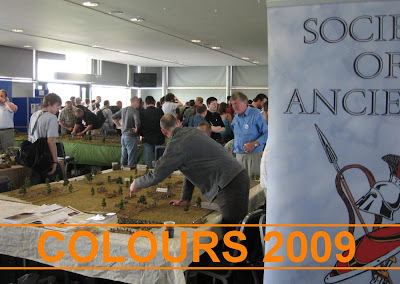 Colours is a two day show, and the Society of Ancients usually gets the most out of the opportunity by changing presentations over the weekend. I guess you win some and you lose some: if you attend both days you get to see both attractions (sadly, one dayers will inevitably miss something).... But you can catch up here. Also on this busy weekend, some visitors got their fist view (and try out) of the Society's new game 'Empire' .. a strategic game by Philip ('lost Battles') Sabin. 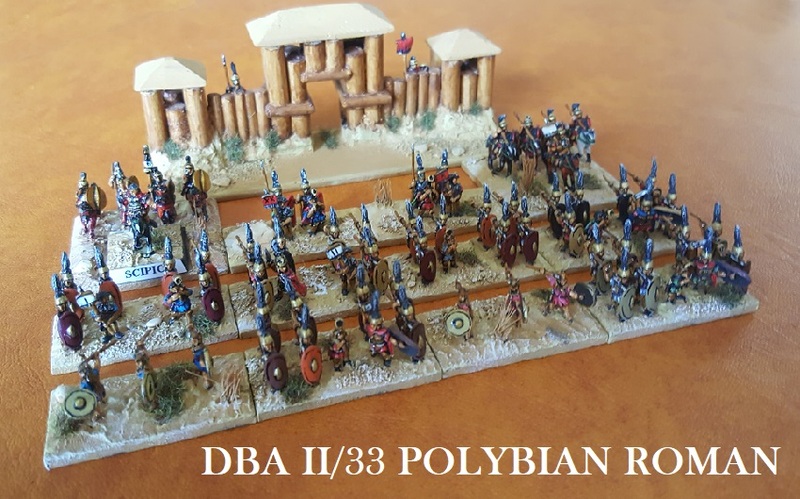 Subtitled 'The Macedonian & Punic Wars, 350 - 150 BC', it is an easy play game for one to four players, simulating the struggle for imperial dominance between Carthaginians, Romans, Macedonians and Persians/Parthians from the 4th to the 2nd centuries BC. The game was distributed as a special bonus to all those 2009 Society of Ancients members who had subscribed for this year by the 31st of January. It is now generally available to those who missed the cut (here ...).. On Saturday, David was able to run through a few turns with people and it seemed very appealing. 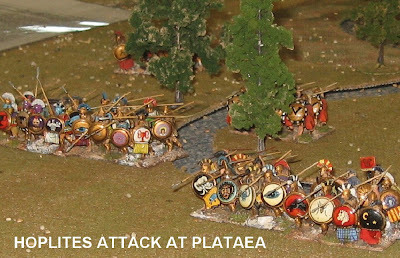 Saturday's big game was a full size Lost Battles encounter from the Persian Wars enabling visitors to play through the decisive events at Plataea in BC479, and the death knell of the Persian occupation of Greece. It looked excellent as ever. Phil Sabin ran the games, with (Mardonius and Pausanias?) Eric Cruttenden and Alan Waller assisting the players on either side (and providing the splendid figures). 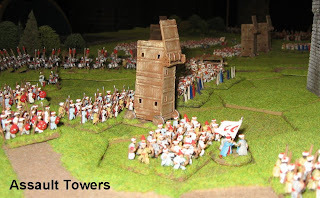 The game ran all day attracting considerable interest both from intrigued newcomers to the increasing number of followers of Phil's Lost Battles project. 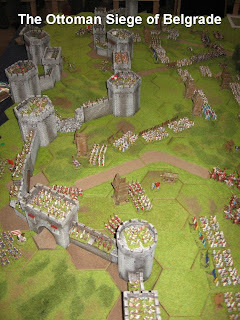 John curry and his team took over the display space on the Sunday for a participation game based on his innovative Medieval Siege rules (and indeed, as Slingshot readers may recall, his strange medieval wargame ...)... 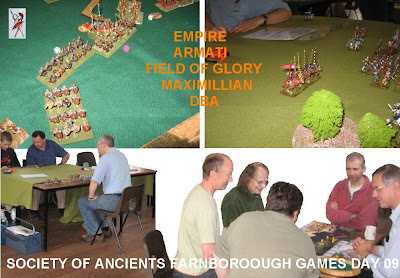 The strangeness in much of this is that John organises siege reenactments, role playing and combat games, and has put the experience from these into the wargames (rather than built them upon a long tradition of miniatures gaming, as is usually the case) with the result that there are many fresh ideas in the games which make more sense the more you think about them. We can add John to the list of game designers who have run their own game on the Society display tables. 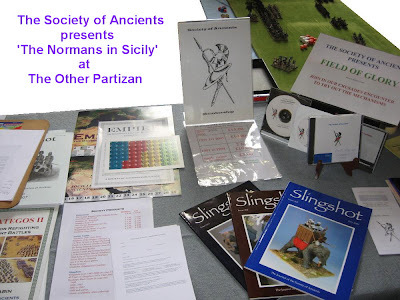 Elsewhere, of course, there was a wide variety of wargaming presentations on offer - perhaps the least usual of which was the regular author of this column taking time off from the Society of Ancients (and moving next door!). 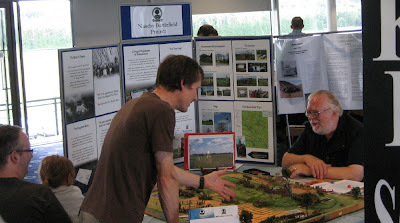 In co-operation with the Pike & Shot Society and the Battlefields Trust, I was presenting my 15mm Naseby game. You can find out more about the game and the project on my ecwbattles blog (here ...) ... but please give a thought to the work of the Battlefields Trust who are dedicated to preserving our historic battlefield from development and deterioration. There is still masses to do, and all forms of help and support count. 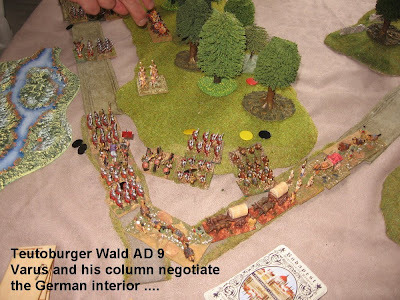 The battlefield was a 'fold away' type built inside a pasting table - as first shown in trial form on this blog at Partizan last year. This attracted quite a lot of interest and will be fully explained on the other blog. 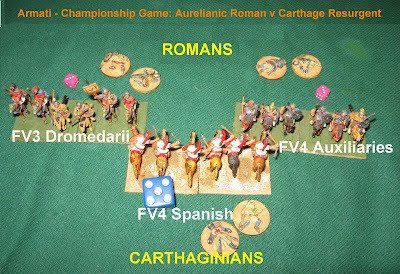 The game was played to Armati ECW rules (a hybrid of Arty Conliffe's Advanced Armati and Armati 2nd edition). 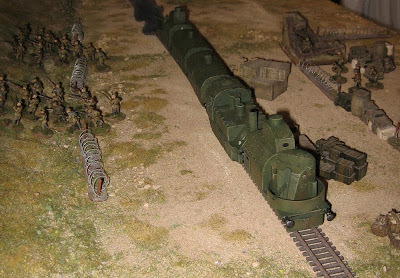 ... which permits the slick link to other stuff going on at the show, staying with Arty Conliffe games but moving to Crossfire. Look at all that terrain. Easy. This was very impressive, but looked a little like Ad Hoc's Salute winning Benghazi game with the jokes taken out ... Seriously though this gateway looks pretty much like the Two Fat Lardies one, which looked a lot like the Ager/Hockley one (honest, it was them, guv - I only painted the insignia on the vehicles ..).. Did the desert airfields really look like this - or have participation game designers started perpetuating their own mythologies? Great game though, guys. Lots of nice models, and plenty of interest throughout the weekend. Did anyone knock over the boiling pasta in this game? Or is that an 'in joke'? The Newark Irregulars host Partizan a second time each year at Kelham Hall, this time early September. 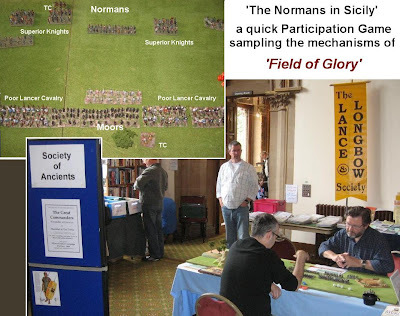 Thanks to Dave Lanchester of the Lance & Longbow Society for the admin at this show (we corner a little shared zone between SoA, L&L, DL books and a game which we hope suits both Lance and Longbow and ourselves). It seems to work. 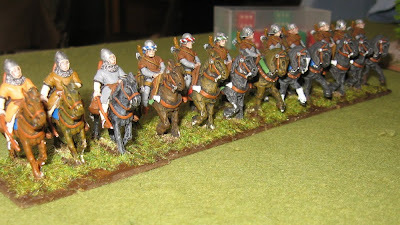 Chris put together a little FoG number - a 'quick to contact' action from the Norman conquest of Sicily (maybe he'll post in with a little extra info on the historical background to this engagement): caught near a river, the Moors have little choice but to fight it out, and hope their numbers will count. I believe the forces were about 400 FoG points per side. The action only takes about 45 mins. 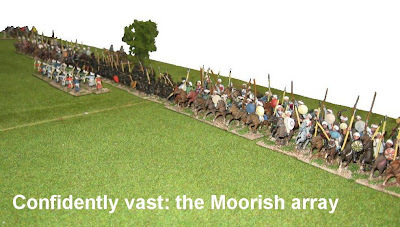 The Moors don't really have room to exploit their better manoeuvrability, the Normans steam in. The gamette quickly shows how FoG's combat and morale systems work (especially how to do the dice allocations and combat poas) ... the visitor, as the Normans, wins ... and enjoys having stopped off with the Society of Ancients. Everyone's a winner. Actually, that was pretty much how it turned out. 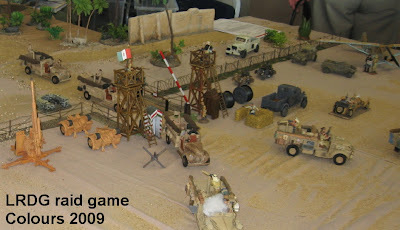 Although the game was necessarily one-sided, what it did well was to show the mechanisms by which quality will overcome quantity in this game system (provided the quality - which in this case was close combat quality - can get to grips with the more numerous enemy ... which catching them against the river ensured). There were a lot of Ancient and Medieval games at Partizan again. Many Warhammer/Warmaster in flavour. 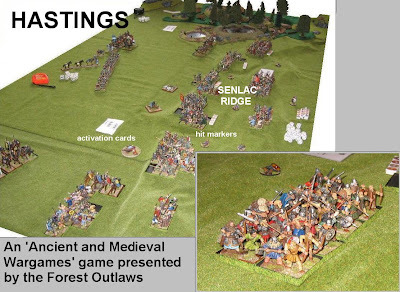 In the same room as us, the Forest Outlaw wargamers from Mansfield were playing a Hastings scenario using a tweaked version of Neil Thomas's rules. As the SoA team also uses AMW, I thought I'd explain the little difference here. Looking to add in few more variables to an encounter where one side pretty much stays still, the game featured a card based activation sequence. Instead of each side taking a turn, then all that side's units shoot, then everyone melees ... each unit had a card, and when that card came out, the unit took a turn, did its shooting or melee etc. Obviously if two consecutive cards were the opposing units in a combat, you would end up with two turns of melee happening before anything else around them. And so forth - I'm sure you get the picture. It did seem to inject a fair amount of unpredictability without changing any of the elegant basics in the game. I don't know if they had a 'Turn End' card in the deck (the way Graham Evans usually would with a card activation deck) ... An intriguing and simple method, I think this is an idea worth having a look at. PICTURES OF SOME OTHER STUFF AT THE SHOW. And, of course, like everyone, we like Elephants. 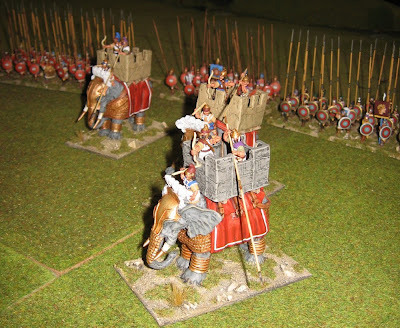 And the next Shows North outing will be Derby, where Graham D. Evans will be inviting visitors to have a go at Neil Thomas's Ancient and Medieval Warfare (AMW) as Alexander the Great.